Funky patterned shirt with long sleeves. Purple/blue colour with a black spray paint effect. Soft and delicate material would look good with black skinny's. 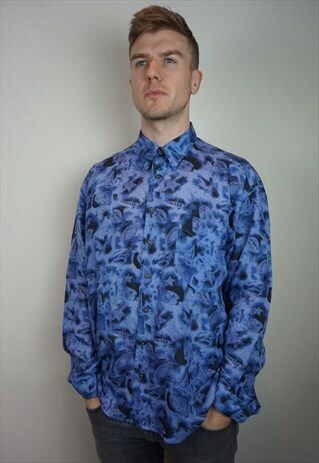 Size Large (generous) - model is a size medium (40-42" chest) and is 6ft 2ins tall. We send all of our shirts to the launderette to be professionally washed, dried and ironed so you can wear them as soon as they arrive.